MAJOR LEAGUE FISHING T.V. GROUP CATCHES BIG NUMBERS AT PICACHOS! Don Rucks along with his M.L.F. crew and ten M.L.F. trip winners recently visited Picachos for their turn at catching insane numbers of bass! None of the ten trip winners had ever fished Lake Picachos previously. All but two had never fished in Mexico prior to this trip. The group arrived on Monday, November 6th to a mostly FULL MOON and water surface temperatures reaching the upper 80’s each day. I know Lake Picachos is a great lake and possibly the best bass lake ever for catching crazy numbers of bass daily, but I have to admit that I was a “tad” worried about the fishing for this M.L.F. group. The conditions for catching bass could not have been worse and with the water temperature unusually hot, I expected the majority of the bass to be deeper than normal for that time of year. Deeper meaning 20′ or deeper. Terry Oldham and I arrived two days ahead of the group and decided to fish out of separate boats in order to locate depth and patterns for the bass. I believed this group was definitely going to need our help. It only took Oldham and I half a day to locate this information. The big schools of bass were hanging out in 15′ – 20′ but suspended. Not very many on the bottom. That meant it was either spinnerbait or crankbait time and as it turned out, BOTH were very effective for attracting bass strikes! These bass were feeding on shad like crazy and anywhere near defined structure such as points with breaks on both sides, humps and underwater islands and shelves/ledges. Oldham and I didn’t waste any time getting these anglers on fish. Oldham worked one end of the lake; I worked the other end. Once we would locate a big school of bass that were feeding, we would leave them biting and go find a boat that wasn’t doing so well. Many times we saw boats of anglers able to sit on one hole and catch bass nonstop! Again, the magic lures were Oldham’s 1 oz spinnerbait and Strike King’s 8XD or 10XD deeper running crankbaits. Also, we were able to find some shallower bass on some points, humps and ledges with a lot of brush and we primarily used the spinnerbaits and Strike King’s 8.0 size square bill KVD Magnum crankbait. Just simply had to get it in within 5′ of the bass and hold on! Everyone had their day or days of catching bass nonstop. There was at least one boat of anglers that didn’t require any help from myself or Oldham: Rick Emmitt of Bass Pro Shops and his partner landed 69 bass the first morning of fishing but almost doubled that number in the afternoon as they finished the day with 201 bass (2 anglers)!!! They sat their boat on ONE SPOT all day and caught 201 bass! Folks, that’s the meaning of FUN! While the conditions were tough that first week of November and the fishing patterns were not “normal” for Picachos’ standards, most if not all of the M.L.F. anglers were able to experience the 100 bass per day/per boat that Picachos is known for producing. Everyone left extremely happy and personally told me they will be back! Since that trip and the horrible conditions that first week of November, the nights have finally started to cool down thus causing the water temps on the surface to cool down as well. 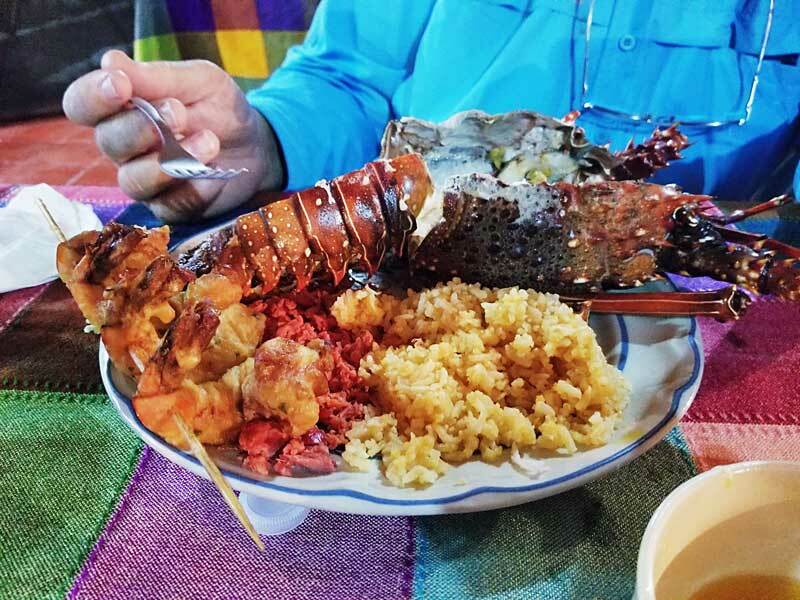 You’ve read and heard me mention this many times: that every year sometime in November, the nights in western Mexico and the area of our 3 lake lodges, begin cooling down and by late November and early December, it is an absolute feeding frenzy on ALL 3 LAKES (Comedero, El Salto and Picachos)!!! Well, that time has arrived and I expect the fishing to remain fantastic from now until next June! RSJA ADDS NEW LOADING DOCK AT PICACHOS! That’s right folks, we have added a new pier or loading dock at our camp on Picachos! The first group (Major League Fishing) of anglers were able to enjoy the new dock during their trip. This huge loading dock will allow up to 6 boats of anglers to load/unload at a time! No more worrying about slipping in the mud (from the daily water falling conditions) while stepping up into your boat. 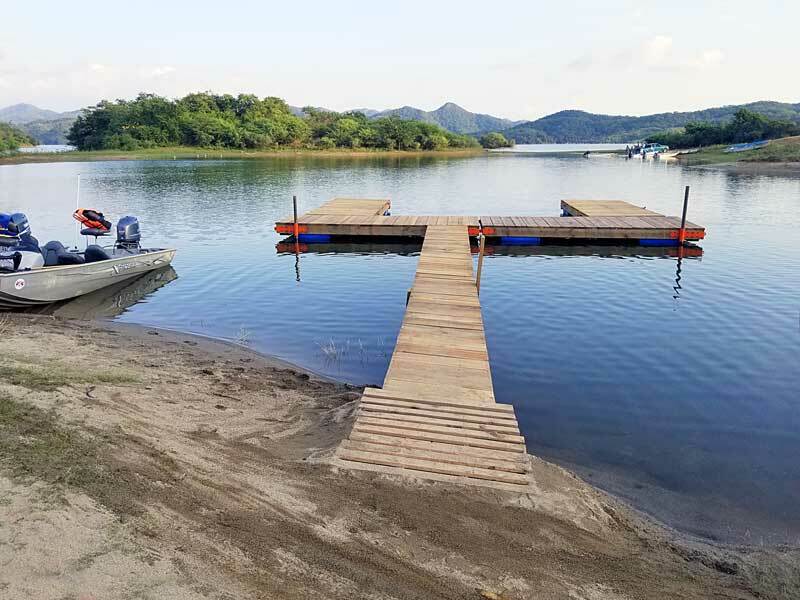 I am confident that ALL of our valuable customers will be very happy with the new dock and how this will make it easier and safer while loading/unloading the boats! 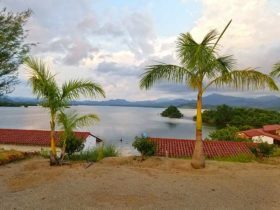 LAKE EL SALTO…NEW TROLLING MOTORS, NEW SONARS…MOUNTED AND READY ON ALL BOATS! As reported here in our last update, we have added new Minn Kota 24 volt with 65 lbs thrust trolling motors on all of the Xpress Boats! We’ve also added new sonars to all boats. They are Lowrance Hook 5 units with Down Scan Imaging feature. 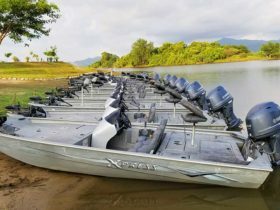 We already had the best bass boats in Mexico with us offering XPRESS BOATS at all 3 of our lake lodges. But now those Xpress Boats at El Salto just got much better! These Xpress boats and the extra features we’ve added to them are all a real bass angler needs or could want while fishing. 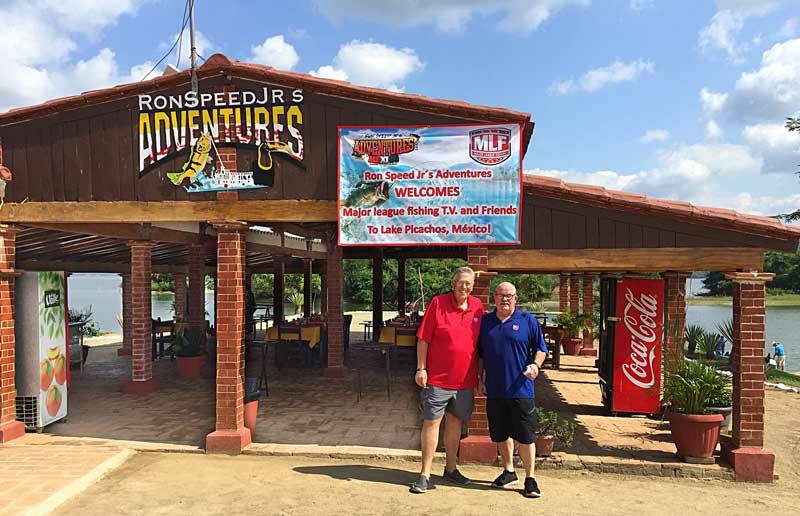 Ron Speed Jr’s Adventures continues to lead the way with offering the very best equipment, facilities, food, service and guides! Our customers do not have to worry about RSJA becoming complacent with it’s service. We will continue to make upgrades where needed and when our customers offer helpful suggestions. We are here to please YOU — FIRST AND FOREMOST! As for the fishing at El Salto, while it started off slow in October due to the same HOT HOT HOT water temperatures that we experienced at Lake Picachos, the nights have since started cooling down, thus causing the water temps to cool down — THUS causing the bass to move to shallower water and feeding like crazy! On the 10th of November Terrence & Saven Richardson landed 142 bass with a 8.8., 8.0., 7.8.,7.0., and 7.0 caught on chrome/blue Rat-L-Trap in 10-12′ of water and on the same day Larry Marler landed a nice 10.0 lb on a 10″ watermelon red Power worm. On November 12 Ken & Kim Seedorf had 57 bass with a 9.5 lb on topwater (white Zara Spook) in 1-5′ of water. November 13 Mike Renek fishing solo landed 40 bass with his two largest being 9.0 & 6.6 all caught on chrome/blue Rat-L-Trap while Frank West and Larry Marler had 43 bass on topwater (white Yellow Magic) with the largest weighing 7lbs. 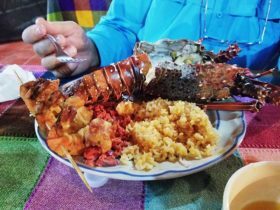 Lobster/seafood fest night at El Salto. 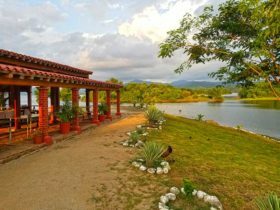 El Salto continues to be one of the best bass lakes in the world as it has been consistently good year in and year out. Everyone loves our lakeside camp with the best boats, food, guides, and service on the lake. LAKE COMEDERO…THE ULTIMATE “CALM BEFORE THE STORM” IS UPON US! point still had plenty of brush and the depth change on each side of the point was actually better this time. I decided I would quit making that square peg fit into a round hole and pick up a 1 oz Oldham spinnerbait with those giant #7 gold willow blades. My first cast — yes, the FIRST CAST — I threw that spinnerbait across the point, working it up the break on the opposite side, then slowly dragging/sweeping it through that brush on top of the point, which was approximately 15′ on top or where my spinnerbait was traveling. When I say “drag” or “sweep”, I mean slowly pull the rod about 2 feet, then reel slowly taking up the slack, then drag/sweep another 2 feet, then take up the slack. After a couple of drags/sweeps through those brush tops on the point, I felt a vicious strike on my spinnerbait! I could feel the weight of this big girl, but no need to holler “NET! NET! NET!” Nope, I was alone with no guide. So I was going to have to carefully play around with this beast, and of course have some luck go my way! After a minute or so, she tired on me and conceded the battle. I got her in the boat and immediately knew she was going to be a double digit fish, and after putting her on the scales, it was confirmed: 10 lbs, 2 oz!!! She was about to pop as she had definitely been gorging herself. A BIG FAT TOAD OF A BASS! After reviving her and releasing back to the water, I didn’t waste any time and made another long cast across that point with that big Oldham spinnerbait. Only one drag/sweep this time and WHAM! Another big girl! This one didn’t feel quite as heavy but was heavy nonetheless. After a rather short battle, I landed her and put on scales: just shy of 8 lbs (7 lbs 14 oz)!!! That’s back-to-back casts producing right at 18 pounds of bass! Boy would I have loved to have had THAT happen back during my bass tourney years! Anyway, I did not immediately make that third cast as I wanted to go tell Oldham to put down that jig and start banging brush with his spinnerbait! After a quick visit to Oldham to share this info, I came back to that same point where I had just landed the two hawgs! As it turned out, the school had either filled up on bait fish or moved back out to deeper water off the point. After 20 minutes with no bite, I headed BACK to Oldham to see if he was having any luck with that spinnerbait? I got my answer as I got within 100 yards of his boat and I saw his rod doubled over! When I shut the motor off and asked how he was doing (as he was releasing a 7 lbs bass back to the water), he chuckled and said, “IT’S BEEN EVERY CAST SINCE YOU LEFT ME 30 MINUTES AGO!” Oldham was fishing two islands relatively close together, with a “swag” or “saddle” in between that was just stacked full of big bass! One bass Oldham hooked up with, he never turned! Seriously, he never turned that bass for one second! Still, Oldham and I stayed in that one area for the next 2 1/2 hours and caught a ton of bass up to 9 lbs. Oldham finished the day with a little over 50 bass (just himself) and had 5 bass over 8 lbs — 3 of those were 9 pounders. I finished the day with 46 bass (by myself) and had 4 over 8 lbs, largest being that 10 lbs, 2 oz toad! Most were caught dragging that Oldham 1 oz spinnerbait through brush tops in 15′ of water! This, my good friends, was during the worst month for fishing the lake, and with water temperatures reaching low 90’s by noon, and NO WIND! Fishing conditions don’t get much worse than this, yet we were still able to catch a lot of bass and a lot of BIG BASS! Of course it took us a half a day to establish the depth and pattern and I can only wonder what our numbers would have been had we started the morning fishing those big spinnerbaits in that brush? This lake’s potential is simply off the charts! You’ve read the stories here. Many of you who have fished the lake have your own stories. This is by far the best trophy bass lake in the world! PERIOD! Unlike many other trophy bass lakes in the world, it’s not a feast or famine trophy lake, meaning you don’t have to sacrifice numbers and just go in all day for that one or two big bites! Nope, not at all. This lake is still churning out an average of 50 – 60 bass per boat/per day average with many boats far exceeding those numbers. No, not everyone will land a 10 lbs bass during their trip…and there isn’t a lake in the world that will produce such. However, for those that don’t land a 10 pound or bigger trophy, there will be many opportunities at 5 – 7 pound bass during 3 or 4 days of fishing AND many will land bass from 8 – 10 lbs (and bigger)! As previously reported here, I am going to keep our camp open until June 1st as I believe the fishing will remain consistently AWESOME through May! I would not do that if I wasn’t very confident in the fishing! We are almost full through the end of March and space is now going fast for April and May. 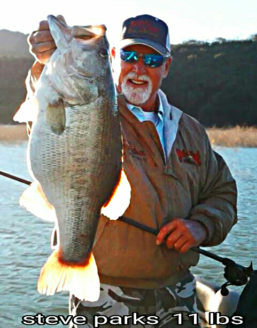 You really should call us TODAY if you want to get in on some of the best trophy bass fishing in the world THIS SEASON! 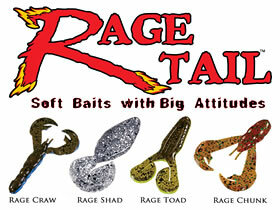 STRIKE KING’S RAGE TAIL/RAGE CRAWS IN #1 COLOR — NOBODY ELSE HAS THEM. RSJA DOES!!! That’s right folks, Ron Speed Jr’s Adventures now offers it’s valuable customers the Strike King Rage Craw in THE #1 COLOR! You cannot buy this color anywhere else but through RSJA! Why? Because Strike King is currently not in production with this particular color. However, I believe the color to be the very best in soft plastic lures on lakes in western Mexico. There are a number of reasons why I believe it to be the very best color for soft plastics when used as jig trailers, spinner bait trailers and also fished Texas and Carolina rig. 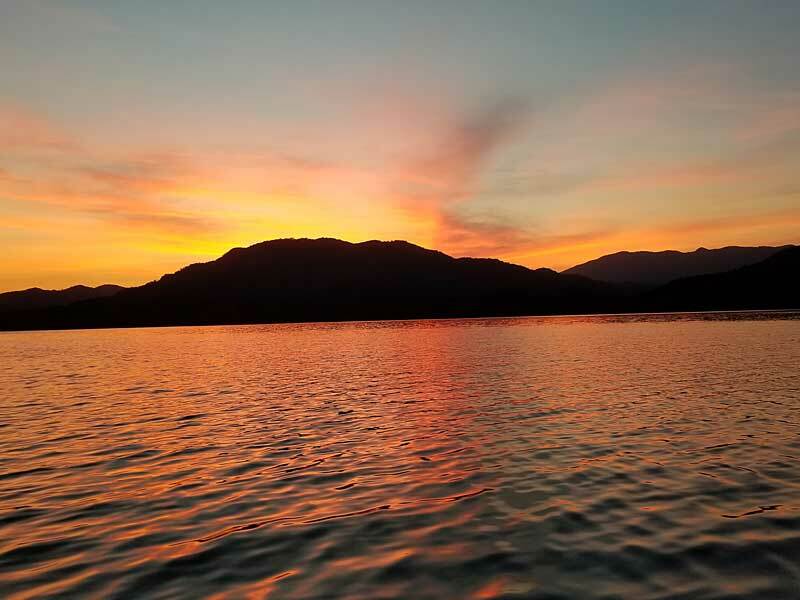 That is, we only have our camps open for fishing on Comedero, El Salto and Picachos during the dry season, and the water clarity during those months on these lakes is perfect for fishing this particular color. Also with the bait fish in these three lakes, this is a color the bass absolutely LOVE! You will not fish a better color in terms of consistent action! Also, I believe Rage Tail’s Rage Craw by Strike King is the very best soft plastic on the market. Again, you can fish the Rage Craw so many different ways! The bass can’t resist the RAGE CRAW! Now you can fish the Rage Craw in the very best color at any of our three lakes, provided you are currently booked with RSJA and deposit paid. These will go very quickly so call us SOON to place your order! Thanks to our dear friends at Strike King and Rage Tail for making this happen for us, AND ESPECIALLY FOR YOU! Call us TODAY to place your order!!! 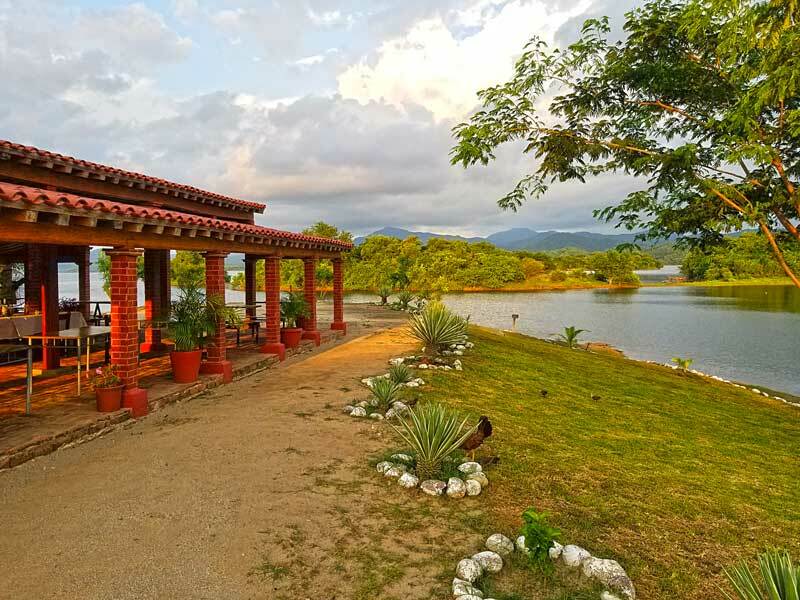 Our fishing season begins this week in Mexico, at least at El Salto and Picachos. We will open at Lake Comedero later this fall once all of the construction and upgrades of the facilities are completed. 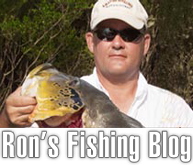 We will have new season fishing reports coming soon. Again, I believe this will be another banner year on the fishing at all three lakes as we’ve seen in recent years. It is time for you to book your trip NOW if you haven’t already done so. Flights are the main issue with seats filling fast on the smaller American Airlines planes to Mazatlan. That is not to mention space at our three lodges is also filling up fast. Many dates are already gone (full) but we still have “some” available. CALL US TODAY!